How crazy fast has this year flown by? I can’t believe December is here – the month I’ve been waiting for is finally here! I’m obsessed with Christmas. Have always been. And I’m so excited that I will finally be going on holiday NEXT WEEK! Can’t wait to share my travel diaries and culinary adventures with you guys. For now, let’s get into my beauty favorites for the month of November. I skipped October favorites because I really didn’t have much to share. I spent the whole month in and out of the hospital and getting used to nurturing my newborn bub, I didn’t have time for makeup and even skincare! Which was why I had a crazy bout of breakouts. Blargh. So, now that I’m much more settled and have adjusted well to my new life with Zayden, I’ve been able to spend more time playing with makeup and taking care of my skin. Last month was all about healing my breakouts and getting my makeup done on-the-go. Read on to see my favorites that really get the job done! I bought this during the crazy 40% Priceline sale and oh – my – goodness I’m so glad I got this shadow. 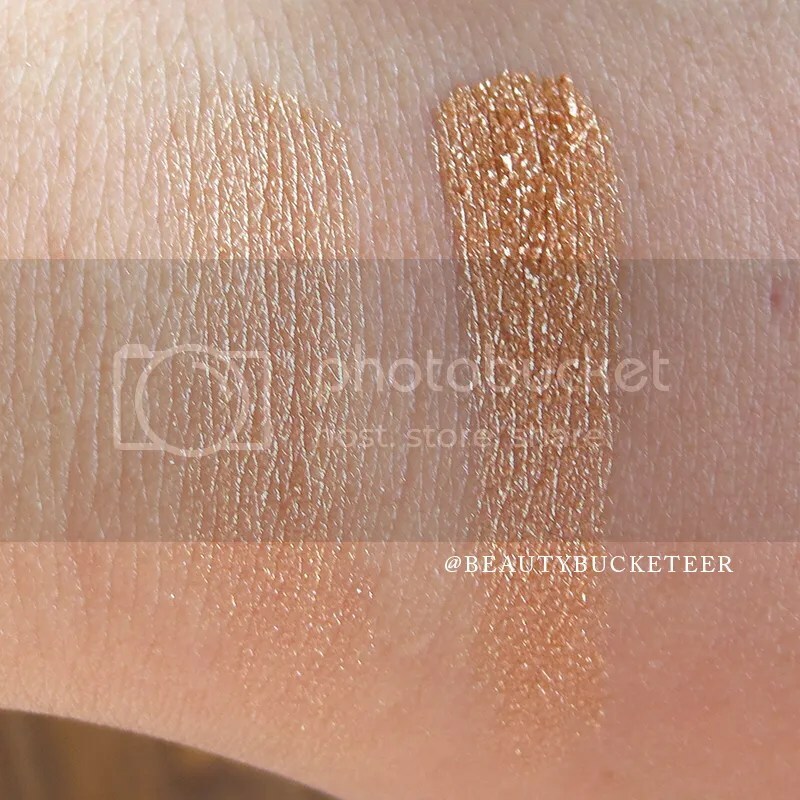 Seriously one of the prettiest gold eyeshadows I’ve ever encountered! I’ve been loving this eyeshadow for use as an all-over lid color. When I’m in a rush, I just swipe and blend this shadow on my eyelids and it looks like I’ve put a bit of effort in getting ready! This is a gel infused eyeshadow so the texture feels a bit more plush and a tad more “bouncy” than powder eyeshadows. I find that the best way to apply this shadow is to wet your brush or finger before picking up the shadow. It looks so much more vibrant and adheres on to the skin better when applied wet. The swatch on the left is a dry swatch, and the left is wet. How vibrant and beautiful is that?! I’ve had this all-in-one palette for a while now, I think I purchased it last year at a Cosmetics Company Store outlet in Orlando. I love that those stores sell limited edition MAC goodies at such affordable prices! 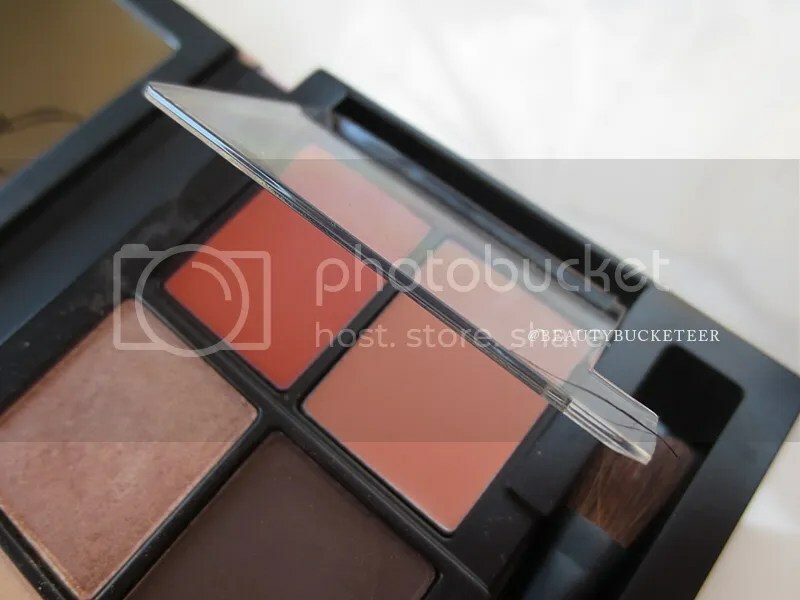 This palette or “face kit” comes with a powder blush (left) in shade Melba, four eyeshadows (Orb, All That Glitters, Smoked Sepia and Show Stopper) and two lip colors in Ravishing (top) and Myth (bottom). “All That Glitters” is my favorite MAC eyeshadow to date, and when I saw this palette I just had to have it because it had that shade and three other neutrals that can help me achieve my signature eye look (i.e. frosty champagne or gold all over the lids with a contoured crease and outer corners). 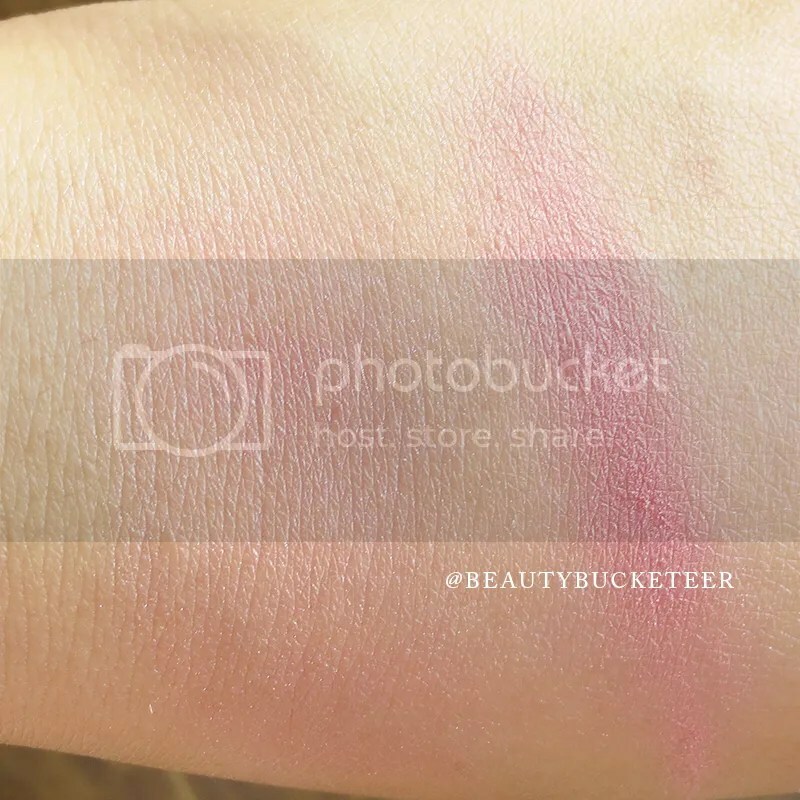 Melba has always been one of my favorite MAC powder blushes too. 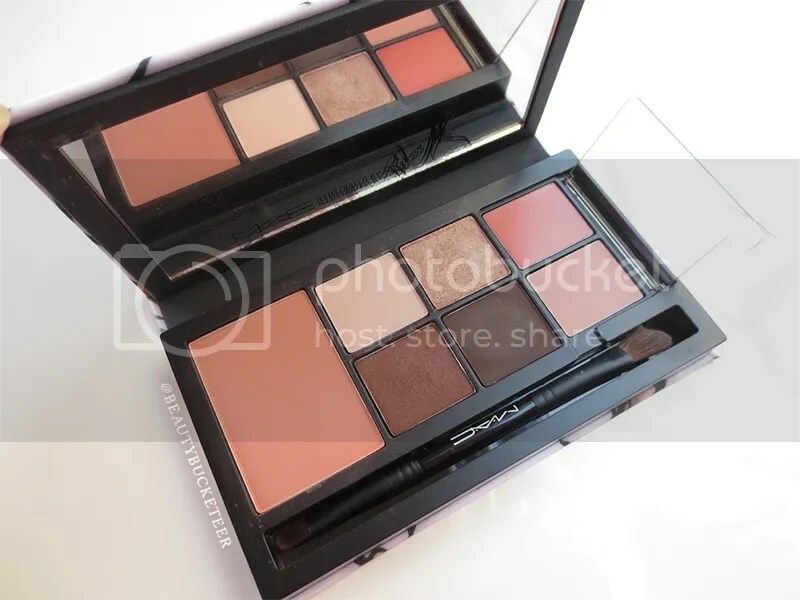 The whole palette has a warm, coral tone to it but is perfect for any skintones or undertones. I’ve never actually touched the lipsticks but I love how they’re encased in a plastic cover that can open up and close to protect them. 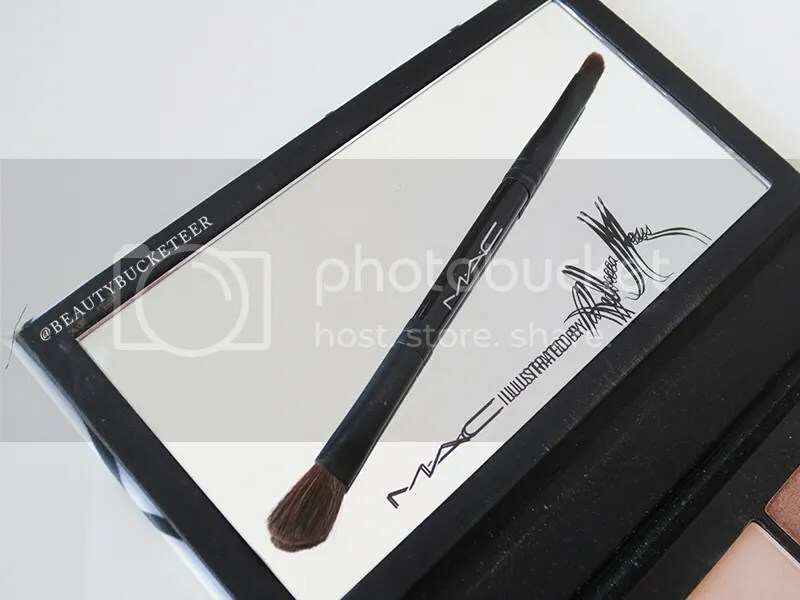 The palette also comes with a double ended brush – an eyeshadow brush on one end, a lip brush on the other end. 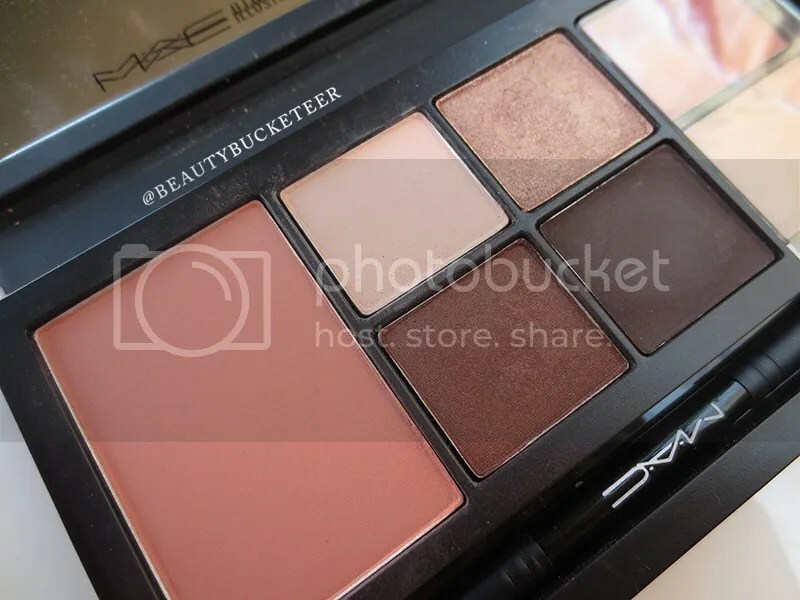 This palette is perfect for traveling! Lately, I’ve been doing my makeup in the car – seriously don’t have time to do it at home. So this comes in very handy – four amazing eyeshadow shades, a very wearable powder blush and two lip colors (even though I’ve never used them!) and a double ended brush. Really helps save a lot of space when you can’t bring much! 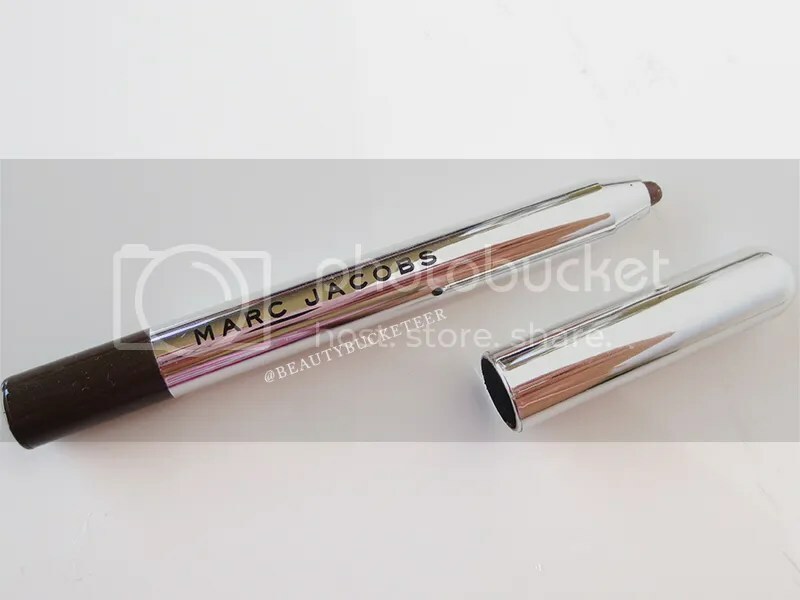 The Marc Jacobs Highliner Gel Crayons are my favorite pencil/crayon eyeliners because they seem to be the only ones that work for my waterline. I’m a contact lens wearer and pencil liners that have a lot of oil content in them would usually end up making my lens cloudy and blurry because the oils from the pencil would transfer on to the surface of the lens. Incredibly annoying! So, this is the only one that’s worked well for me so far. And it lasts a long time too, up to 6 hours! I love the black shade too but lately I’ve been using this a lot just in the outer corners of my lower lashline (not the waterline) to make my eyes “pop” a bit more and it would seriously last all day. And I guess it’s pretty water resistant because I use eye drops during the day and this doesn’t budge. I can’t live without this baby! Eek! Just how adorable are these brushes?! These (especially the eyeshadow brushes) have been the only ones I’ve been using for the past month and a half. Seriously. I’ve forgotten about all my other brushes. 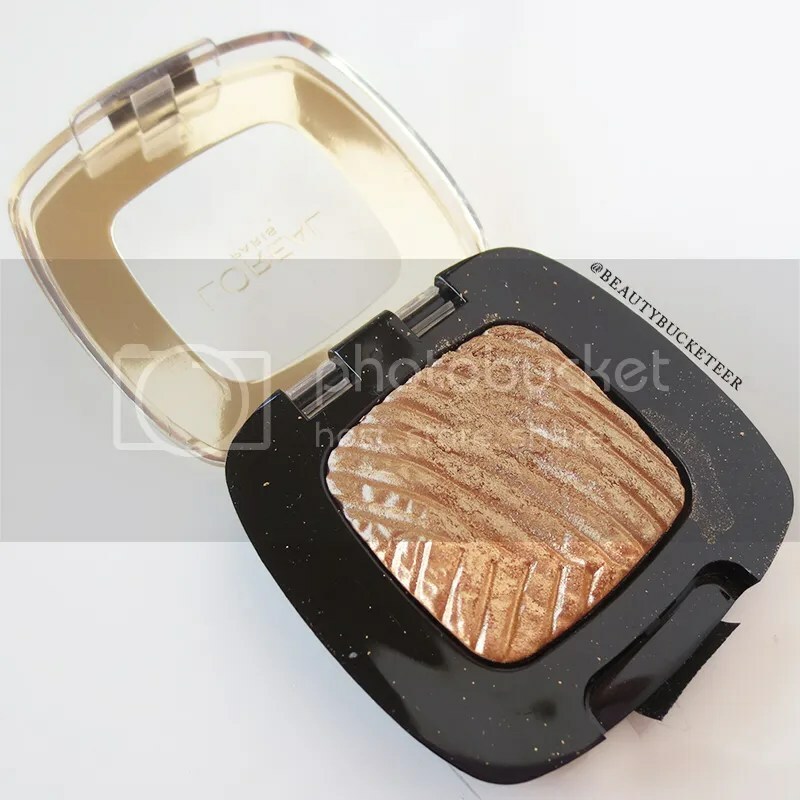 It comes with a powder, all-over shadow, contour, liner and blender brush. It’s everything I’ve ever needed! I just wish it’d come with a blush brush though, that’s be really handy! The four eyeshadow brushes are the only brushes I’d ever need to create any type of eye look and all five of them are the softest brushes I’ve ever had. It’s so soft that I get sleepy every time I use the powder brush all over my face. It’s that soft. I’m also obsessed with the makeup pouch that it comes with!! This has been my favorite blush for the past two months. Click here for my full review of my recent Gucci purchases. 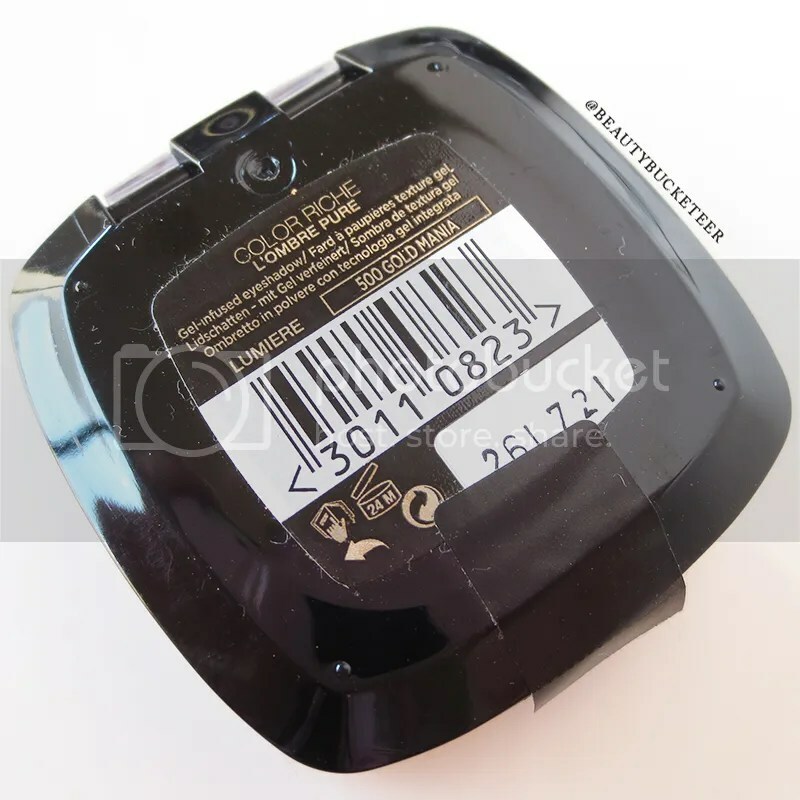 Can we just take a moment to appreciate the beautiful embossing on that pressed powder blush? 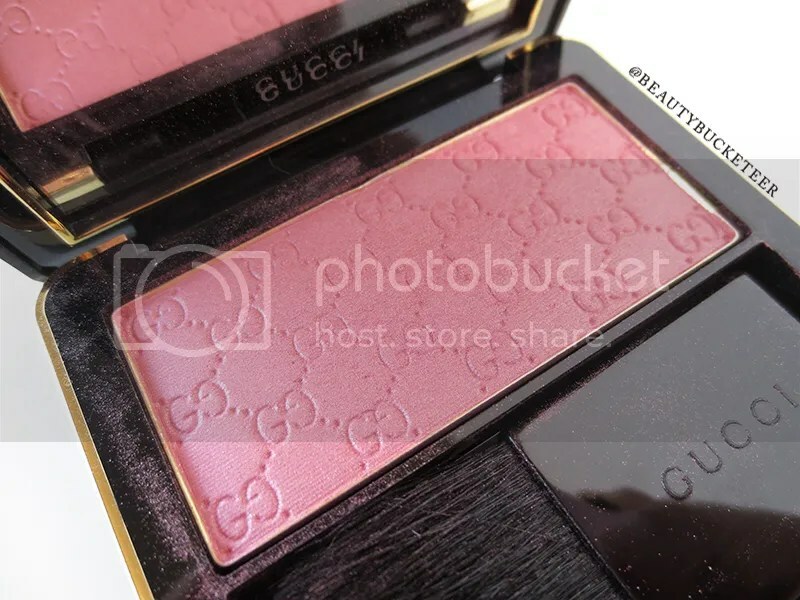 I ordered this online only a few days after it’s released in the States and back then there were no swatches of any of their products available on the Web, so ordering this shade based on the pictures on the official Gucci website was such a gamble! I’m so glad I got this shade though, it’s a medium cool-toned pink with a luminous sheen to it. Swatched on the left hand side is the swatch of the blush once blended, and the right one is a heavy swatch, built on a few layers. 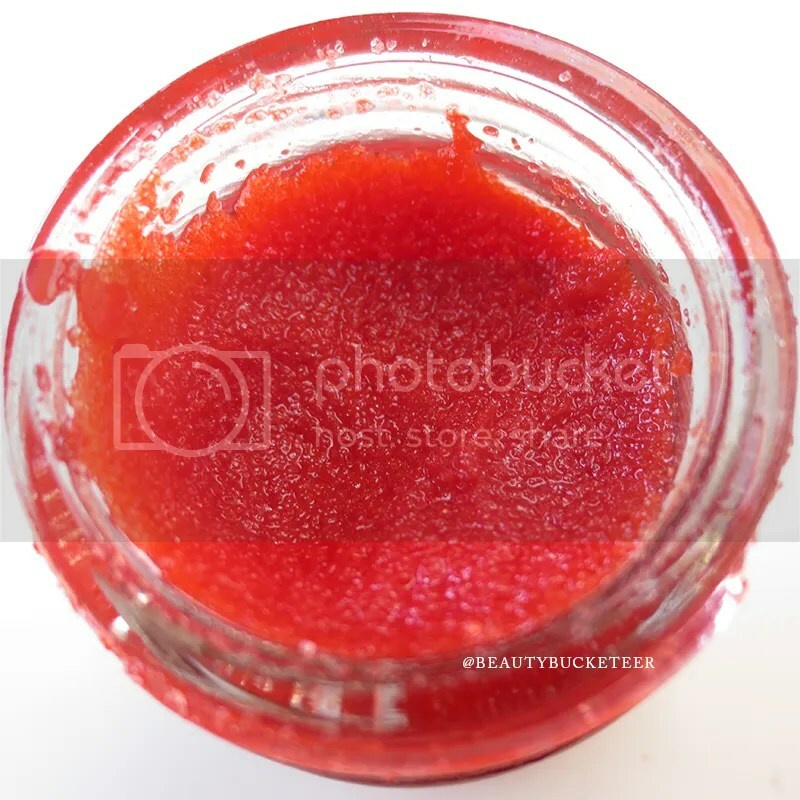 It does look very cool toned when swatched heavily but when applied lighthandedly on the cheeks it has a very luminous sheen to it that I don’t even need to apply a highlighter on top of it to add dimension to my cheeks. 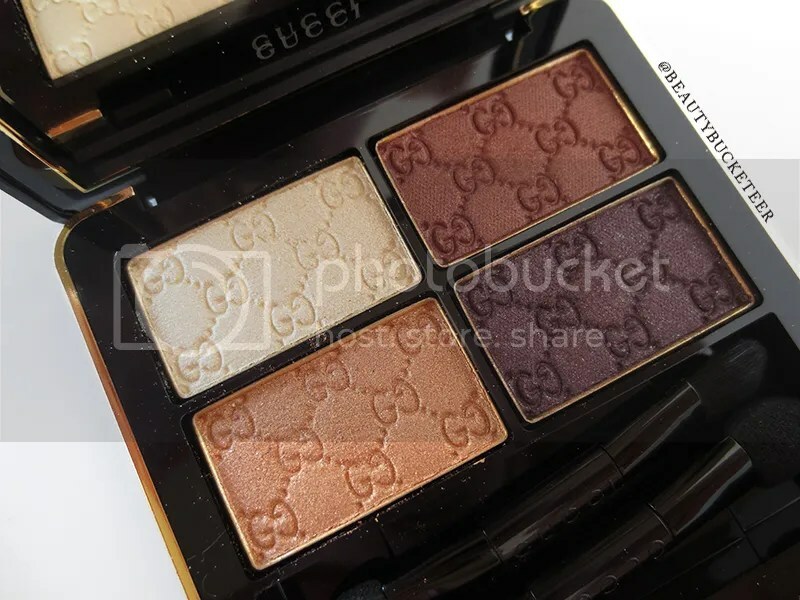 I am also in love with the Gucci Eye Magentic Color Shadow Quad in 030 Crystal Copper but I don’t really want to include it in this month’s favorites because I’ve only used it once, and as beautiful as it was I wanted to give it a few more tries before I can list it as a favorite! Click here for my review of all my Gucci purchases. This has been my go-to makeup bag for the past month. I love it so much! 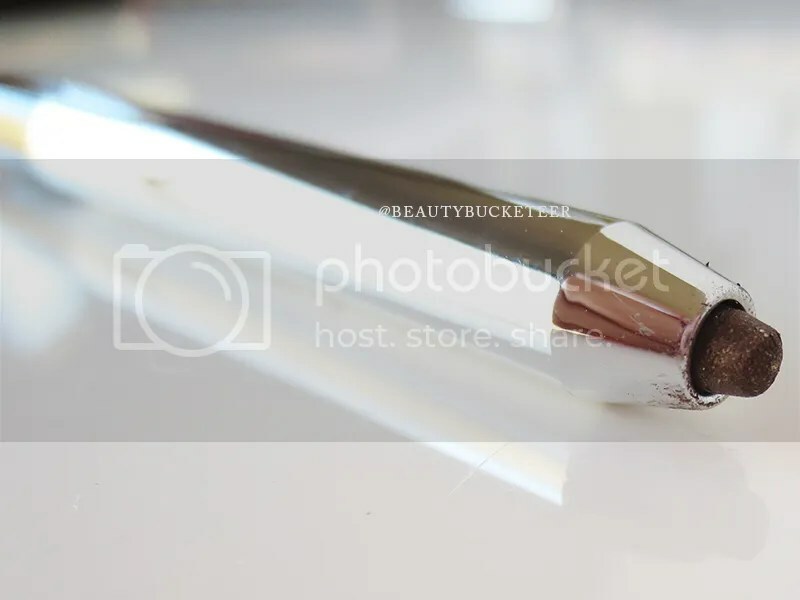 A makeup bag with a brush roll attached to it? Yes, please! 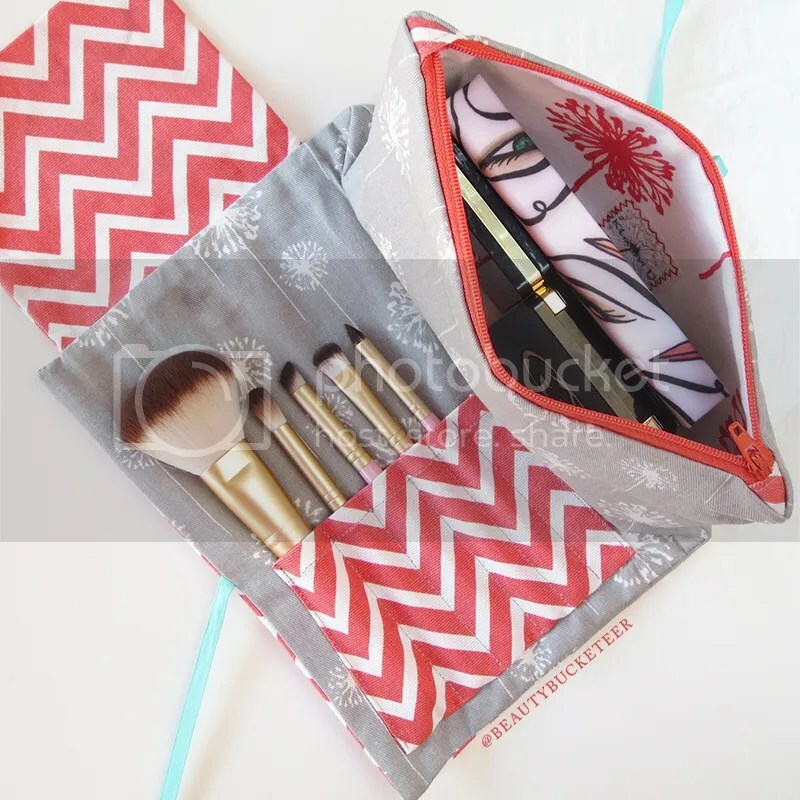 This makeup bag is handmade by Laura from LauraKCreations on Etsy and there are lots of different patterns and colors to choose from! You can even order a customized one. Check out her store here. I can fit all my Too Faced Teddy Bear Hair Brush Set brushes here and there’s space for one more, so I usually put my blush brush in there. And the makeup bag itself is pretty spacious. 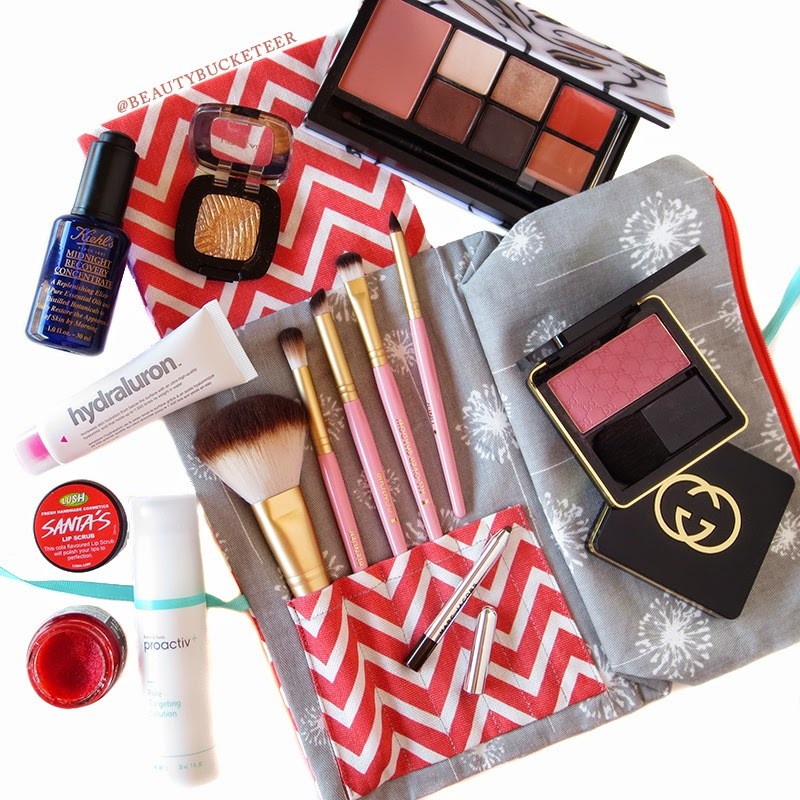 Great as a weekender or on-the-go makeup bag! Don’t know how I could live without THIS. I’ve been a Proactiv user for years but had to stop using it when I was pregnant. Not because the Benzoyl Peroxide, but because it was way too drying for my sensitive skin. My skin was super duper sensitive during pregnancy. Well I’m glad I got the Proactiv Plus Pore Targeting Solution because this is the new version of the original Proactiv 3-step system’s “Repair Lotion” (third step). This newer version is much less drying, even the consistency of the lotion is much thinner and runnier than the original. This has helped heal my acne and skin congestions tremendously. I love that it’s not as drying as the original forumla. Such a lifesaver. 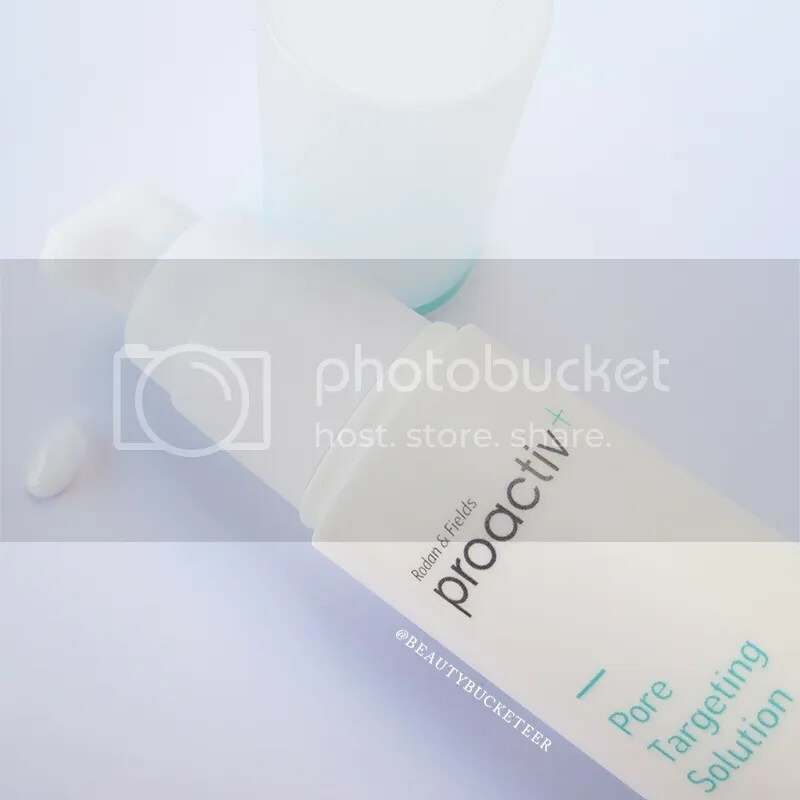 Even though the Proactiv Plus Pore Targeting Solution isn’t as drying as the original formula, it can still be a bit drying. Just occasionally though, especially when the weather is really dry. So, my skin has been a bit dry and tight lately, but it’s a combination of hormones and weather too! I usually resort to my Chanel Hydra Beauty Serum when I have terribly dry skin, but lately it doesn’t seem to work. So, I was browsing through moisturizers in my local pharmacy a few weeks ago and came across this product. I’ve heard a lot of hype about this product, so I thought I’d give this a try and my oh my, I’m obsessed! 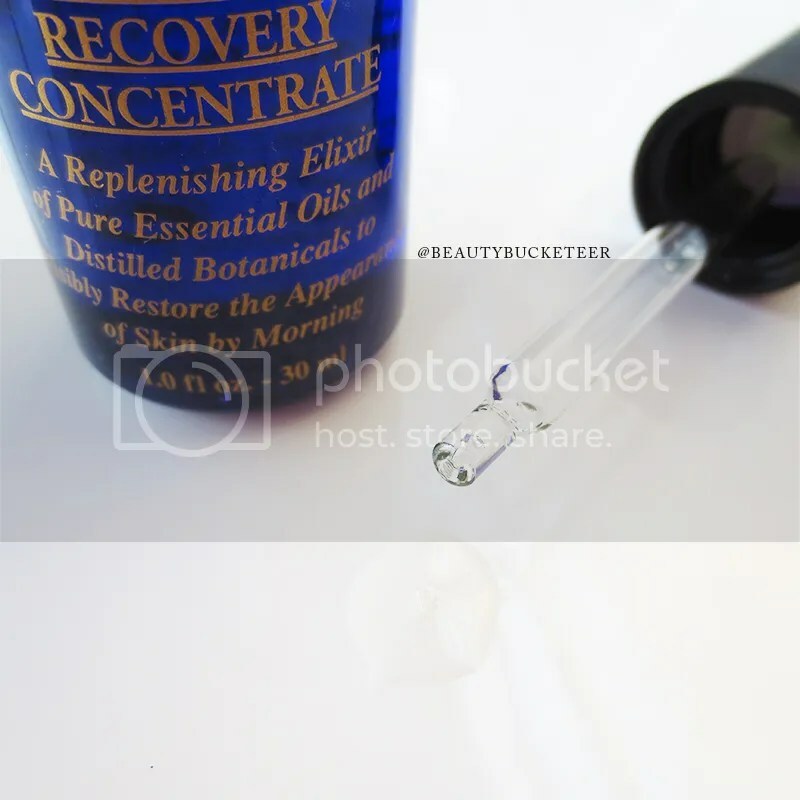 This hydrating serum has a gel consistency that is very tacky once applied on the skin, kind of weird at first but I got used to it after a while. 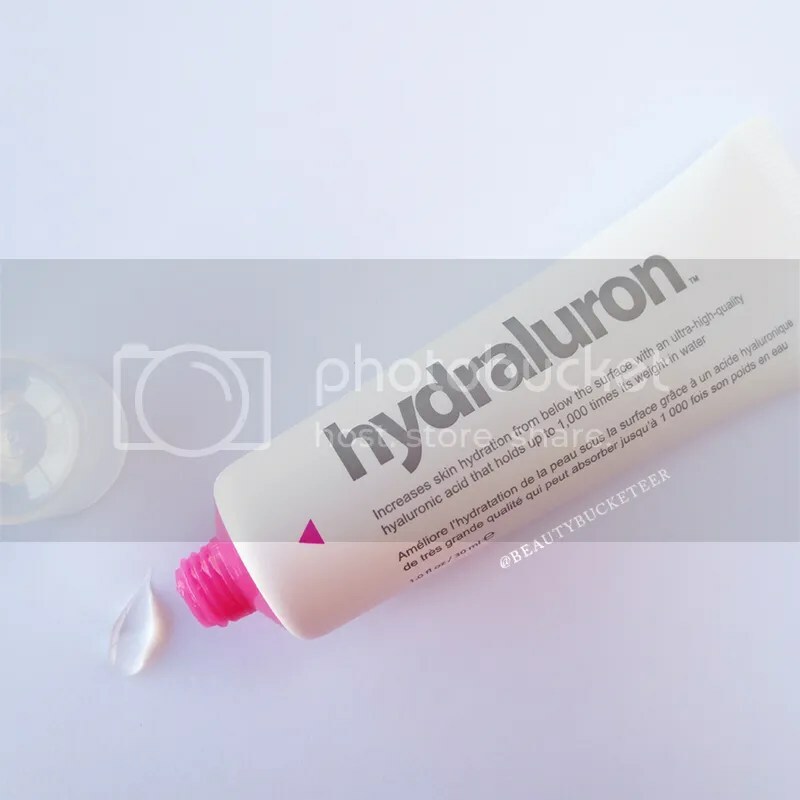 It’s not supposed to replace moisturizer, it’s just a hydration “booster” for the skin. Ever since I’ve been using this (day and night), my skin has felt so much plumper and less tight/dry. However, I’ve also been adding this gem to my routine. So the credit goes both to the Hydraluron and to the Kiehl’s Midnight Recovery Concentrate. I love mixing this with my moisturizer. The current one I’m using is the First Aid Beauty Ultra Repair Cream and it’s been working wonders for my skin. My skin has never felt so smooth and problem-free! My skin isn’t the only thing that’s been really dry. My lips have been too! 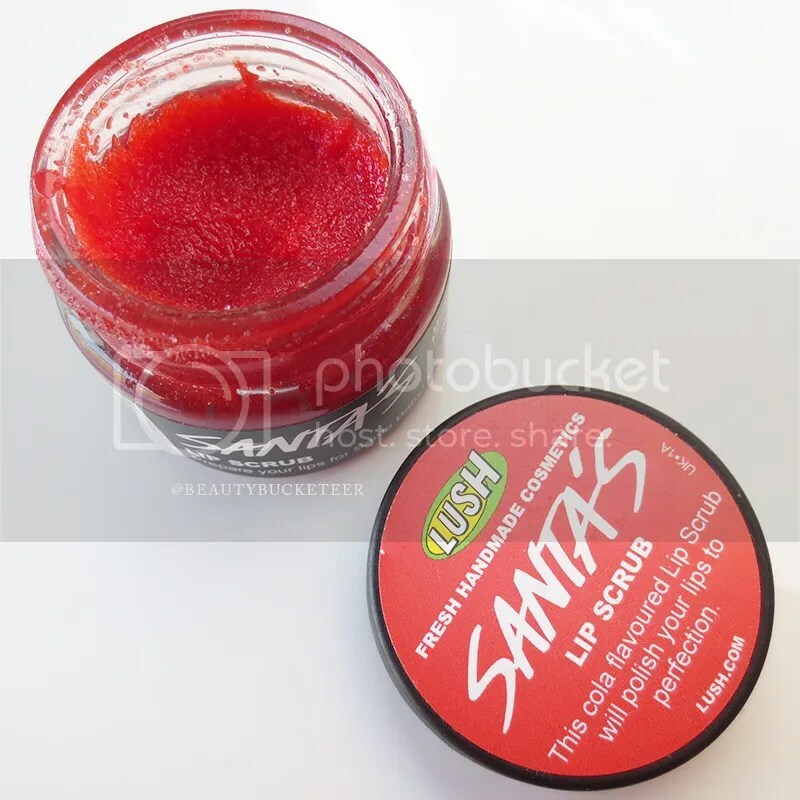 It’s been peeling a lot and this lip scrub has been my lip’s lifesaver! I love that it smells like Cherry Cola and when washed off, the taste and smell still lingers! Smooth skin. Smooth lips. Life is good! So what have you guys been loving this month? Were there anything from my favorites that you’ve tried? If so, let me know what your thoughts are!